Diya, or oil lamp, in different forms. 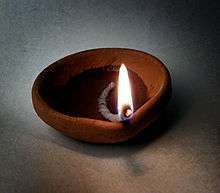 A Diya, Diyo, Deya, divaa, deepa, deepam, or deepak is an oil lamp used in Nepal and India, usually made from clay, with a cotton wick dipped in ghee or vegetable oils. Clay diyas are often used temporarily as lighting for special occasions, while diyas made of brass are permanent fixtures in homes and temples. Diyas are native to India and Nepal often used in Hindu, Sikh, Jain and Zoroastrian religious festivals such as Diwali or the Kushti ceremony. A similar lamp called a butter lamp is used in Tibetan Buddhist offerings as well. Diyas, also known as deepam in Tamil Nadu, can be lighted, especially during the Karthikai Deepam. A diya placed in temples and used to bless worshippers is referred to as an aarti. Wikimedia Commons has media related to Diya.